TALLAHASSEE, FL—Saying they had put up with the destruction inflicted by gale-force winds and storm surges for much too long, government officials urged Florida residents Thursday to put an end to disasters once and for all by standing up to Hurricane Matthew. “No more running; no more hiding—it’s time for Floridians to come together in solidarity and confront this Category 4 storm head-on by finally saying ‘Enough is enough,’” said Florida governor Rick Scott, stressing that the state’s residents would no longer let themselves be pushed around by violent tropical cyclones and noting that it was long past due for them to put on a brave face, stand firm against the 140-mph gusts, and show the massive rotating storm systems that they would not be intimidated. “If we ever want our state to be safe and secure, we cannot simply cower in fear inside evacuation centers every time we’re threatened by high winds and 20 inches of rain. 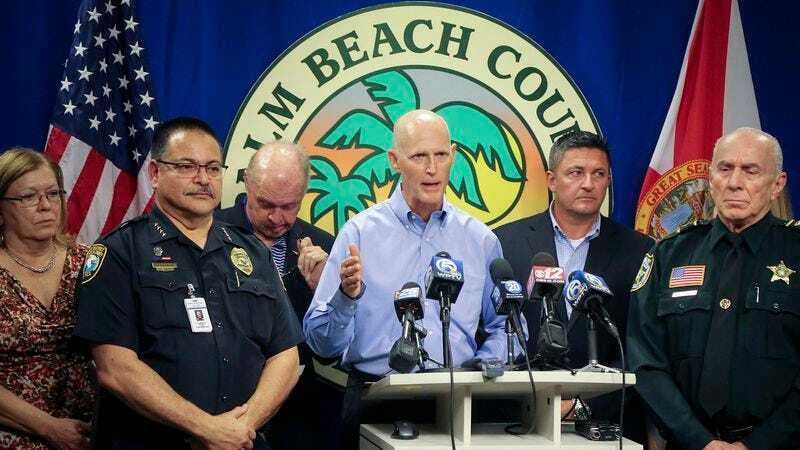 Eventually, we must stand tall, look these tropical cyclones right in the eye, and tell them to stop right now.” Authorities added that if strongly worded language did not prove sufficient, citizens should be prepared to use physical force to fight the hurricane.